Treat your hair to the nourishing properties of HAIRFINITY Revitalizing Leave-In Conditioner, a lightweight, leave-in treatment that delivers essential moisture whilst protecting against frizz and heat damage. Formulated with over 98% natural ingredients, including Quinoa and Baobab extract, the leave-in conditioner expertly softens and detangles your tresses whilst reinforcing the hair's cuticle with its ultra-nourishing mineral infusion. Absorbing quickly into hair with no greasy residue, it provides essential minerals and improves moisture and manageability when wet or dry. It even protects hair during heat styling. Utilising an exclusive Capilsana® Complex, it delivers a unique blend of bioactive Hydrolyzed Collagen to strengthen and revitalise hair. The conditioner provides naturally occurring building blocks for healthier, more resilient locks that are less prone to breakage. Hair has increased shine, improved strength and reduced split ends. Infused with a calming fragrance powered by Sea Salt, Hibiscus and Essential Oils. Formulated with over 98% natural ingredients. Free from cruelty, ​sulphates, silicone, parabens, phthalates, mineral oil and petroleum. 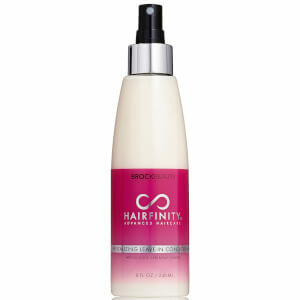 Spritz wet hair and gently distribute with fingers or a wide tooth comb before styling. Can be used daily. Aqua, Aloe Barbadensis Leaf Juice, Saccharomyces/Zinc Ferment, Saccharomyces/Copper Ferment, Saccharomyces/Magnesium Ferment, Saccharomyces/Iron Ferment, Saccharomyces/Silicon Ferment, Cetearyl Alcohol, Polyquaternium-47, Fragrance, Glycerin, Phenoxylethanol, Caprylyl Glycol, Ethylhexylglycerin, Hexylene Glycol, Behentrimonium Chloride, Hydrolyzed Adansonia Digitata Seed Extract, Hydrolyzed Quinoa, Hydrolyzed Collagen, Simmondsia Chinensis (Jojoba) Seed Oil, Camelina Sativa Seed Oil, Cocos Nucifera (Coconut) Oil, Dimethyl Sulfone, Organic Lavandula Angustifolia (Lavender) Oil, Thuja Occidentalis Leaf Oil, Organic Cinnamomum Zeylanicum Bark Oil, Rosmarinus Officinalis (Rosemary) Leaf Oil, Thymus.